The newly launched OnStar FMV (For My Vehicle) product -- the first out-of-the-box application of OnStar's automotive safety and connectivity services -- is now the focus of a new marketing campaign by ad agency Campbell Ewald. Turning to The Mill to direct and produce the series, the world inside the box was created for both broadcast and digital media by artfully bringing together live action and animation. 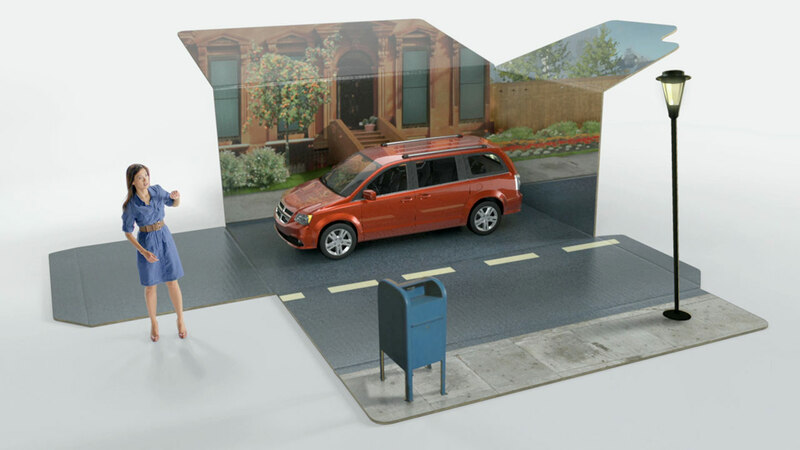 The art direction of the overall campaign creative takes the audience into an unfolding world inside of the box where an OnStar Advisor quickly addresses every challenge. "We wanted to extend the unfolding box idea through to the entire spot," says Co-Director Ben Smith of The Mill. "So when writing the treatment, we built the idea into the individual caller's situations. For example, a stranded motorist calls an OnStar operator to ask for help and the street "unfolds" to reveal emergency vehicles." With only three days in Los Angeles to shoot four digital vignettes, two broadcast spots - one for summer and one for winter, and a series of banner ads equivalent to four and a half minutes of unique content, the crew had to stick to a meticulously planned schedule. "This is one of the most ambitious shoots that The Mill has undertaken," says Co-Director Yann Mabille. "Finding locations for two different seasons was a challenge as we had to avoid green trees and make sure the light was diffuse enough to shift the grade of a single shot from winter to summer." Shot with the Alexa, a 50 foot technocrane was used on set to get the overhead shots. HDRIs were taken at every location to facilitate build out of the CGI environments. Viewers get a deeper dive into the world inside the OnStar FMV box with rotating cars and flipping locations, all of which were created using Softimage XSI and Nuke software. Life-size boxes match the dimensions of online banners with firemen, police and other professionals 'living' inside the box. According to VFX Supervisor Boris Ustaev, "Creating photo-real people, cars, and buildings in a short, five week time span was challenging. We used photogrammetry - shots recreated using only photos - on cars, buildings, environments, and on the police officer and EMT. We even used it on the pull-out shot where we go from the accident scene, past the OnStar box and into the Best Buy store. That entire shot was re-created using only photos on simple 3D objects. Even the actors in that scene are all 3D generated." "The campaign is a multimedia experience that connects consumers to OnStar FMV and communicates a whole new world of safety and connectivity that is now available to be added to millions of vehicles currently on the road," said Sam Mancuso, chief marketing officer of OnStar. "The rich media platform allows us to educate and inform consumers about the features and benefits of the OnStar FMV product while allowing them to engage in real-time multi-channel conversations, all through the OnStar FMV brand channel."